When astronauts blast off into space, it doesn’t take long before their bodies become massive floating garbage bags full of problems. 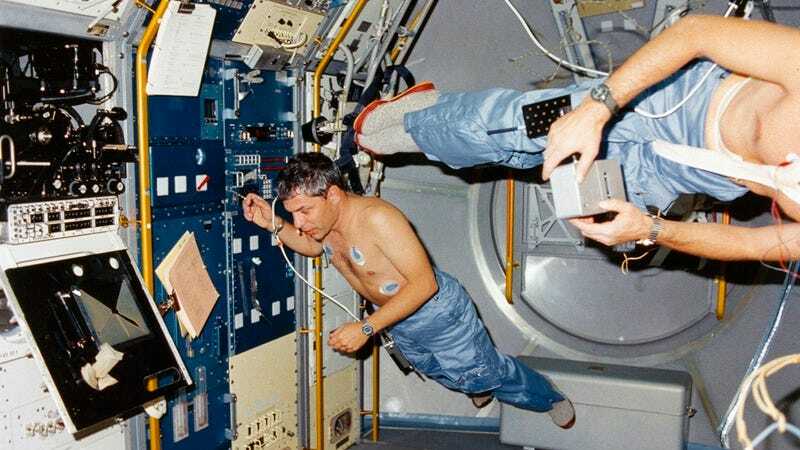 Here are six biological changes that all humans undergo while in outer space. 1. Without any wasps to worry about, your eyes slowly go blind: Use it or lose it! With no insects to sting you in space, let’s face it, there’s really no reason for humans to see. Astronauts, say goodbye to your enemy the wasp, but also to your eyesight, because by the time you get back to Earth, you’ll be totally blind! 2. Human hair grows in the direction of Mars… aggressively: Yikes. Your hair might be annoying on Earth, but wait until you’re in space and it grows uncontrollably fast toward the little red planet. It will become incredibly thick and indestructibly strong, and no matter where your body moves, it’ll yank you toward Mars as well. Uh, good luck styling it! 3. The heart goes sour: The time spent isolated in that damned sterile tube looking down at that big old planet you abandoned ain’t good for the heart. It starts to devise all these wicked schemes from its place of pain. It’s enough to kill a man, kill him slowly from the inside. 4. The left umbrus of the lower retortion confixes, causing a total corticol implosion throughout the flumbox system: So, unlike on Earth, where the lower retortion is always averved, space causes the pelial compass to centrigate the mid and lower retortion, which results in a severe umbrusial confixion. Without the gravitational core of the heptilidron’s retolaxes, the quorlon is susceptible to demiglare, which can cause as many as four quintillion extocores within a single human cell. 5. The body, outside of Earth’s gravitational field, returns to being Italy-shaped: Honestly, it’s the best perk of being in space. 6. Your pee floats away in the air, even after you get back to Earth: Even when you leave space for good, your urine will still float through the air as tiny glistening droplets, instead of going straight down into the toilet. It’ll go away after a month, but until then, stay out of public bathrooms, okay? Old habits die hard.